MILWAUKEE – Interested in adopting a cat? There is no better time, as the Wisconsin Humane Society has an unusually large population of adoptable cats, and staff members hope to have a busy week of cat adoptions. The Wisconsin Humane Society has already adopted 324 cats this month, but they hope to reach 375 by the 4th of July weekend. During the month of June, every cat adopter will take home a great prize, including treats and catnip squares. Adoption fees range from $150 for kittens five months and younger, to completely waived fees for adult cats more than one year of age. Included in the cat adoption are spay/neuter, first distemper vaccination, initial deworming, feline leukemia testing, microchip implant, a certificate for a free veterinary exam, and a 30 day gift of ShelterCare Pet Insurance. 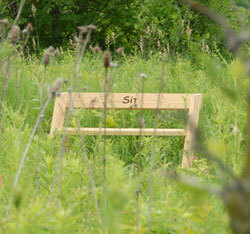 The bench beckoned from beyond a field of berries and teasle with a single eloquent word, “Sit”. How often do we use that word…to our dogs, kids, to others, without ever giving ourselves permission to just sit a spell and watch the world go by? 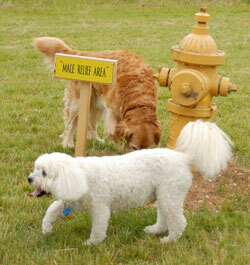 With the opening of the West Bend Dog Park on June 26th, we now have such an excuse. It’s been two years of lobbying and hands-dirty hard work for Jill, Pam and the rest of the K-9 Friends of West Bend. The off-leash dog park, once a distant dream, is now reality and open for the community to enjoy. We stopped by the afternoon of the opening to catch up on the progress and were thorougly impressed. From the welcoming entrance gates to the wide open fields and forest paths, this park is a gem. Whether you’re in the mood for a patch of sun or a quiet shady spot, numerous park benches offer the perfect accomodations. Many have been donated by local families and businesses and carry etched messages of endearment…and a bit of humor. 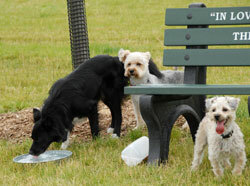 Waste stations are sprinkled throughout the park, making cleanup an easy task for dog owners. When Fetch ran it’s article on the dog park in the December, 2009 issue, Jill Recore shared her vision of the park-to-come, “a place where dogs anticipate their owners coming home, putting them into their car and driving to their ‘new dog park’ that is their place to enjoy the smells, run, play ball, Frisbee and socialize with many new friends each time they come. Along with their owners, meeting new dog friends and building our city into an incredibly inviting community for many to come, experience and enjoy.” It was an incredible vision back when the park was open farm field and it is even a more incredible reality. Hats off to the entire K-9 Friends of West Bend crew for their fortitude in making this park happen. You done good! There’s more work to be done as K-9 Friends continues to work on park financing and amassing the crew of volunteers needed to maintain the park. To help with ongoing costs, admission to the park will be sold by subscription at a very reasonable $25, annually, per household. Our heart-shaped tag is on our kitchen key rack, ready to go. For information on park rules, subscription information and volunteer opportunities, visit the K-9 Friends of West Bend website. From what we could see today at the park, dogs were enjoying their life in the moment. Breeds, big and small were charging across the open spaces, making the most of their opportunity to run free. Let’s all take a lesson from that and leave our human cares at the park entrance, go on in and enjoy the day. MILWAUKEE – Every day at the Wisconsin Humane Society kittens lock eyes with potential adopters. All of the fantastic cats currently available for adoption at the Wisconsin Humane Society are patiently awaiting their new families. Read more missed connections at http://www.wihumane.org/animals/missedconnections.aspx. This weekend at the Wisconsin Humane Society, each adopter of an adult cat will receive a FREE ticket to Summerfest, as well at 15% off a regularly priced item in the Wisconsin Humane Society retail store, Animal Antics. Adopters of two buddy cats will receive two FREE Summerfest tickets. In celebration of FelineFest, during the month of June, every cat adopter will take home a great prize, including treats and catnip squares. Adoption fees range from $150 for kittens five months and younger, to completely waived fees for adult cats more than one year of age. Included in the cat adoption are spay/neuter, first distemper vaccination, initial deworming, feline leukemia testing, microchip implant, a certificate for a free veterinary exam, and a 30 day gift of ShelterCare Pet Insurance. Event Details : Golden Retriever Rescue of WI (GRRoW), a 501(c)(3) non-profit organization, is coordinating its largest annual fundraiser, Tails on Trails Dog Walk. This event is on Saturday, Oct. 23 at Kettle Moraine State Forest – Lapham Peak Unit in Delafield, WI. For more information, vist http://www.grrow.org. What could be more fun than a bunch of happy dogs running around a new park? 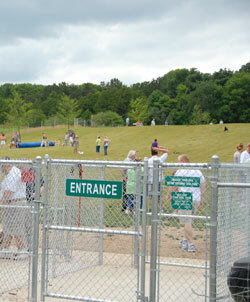 West Bend Dog Park will be having their grand opening, Saturday, June 26 at Noon. There will be opening ceremonies, vendors, and off-leash fun! The park is located north of Paradise Drive on 18th Avenue in West Bend. www.westbenddogpark.com. Smile for the Camera, Scout! Entries are now being accepted. There is a $15 non-refundable entry fee per first photo and $5 fee for each additional photo. All proceeds from the calendar benefit the animals at the Wisconsin Humane Society. There are also advertising opportunities available to area businesses! Check out the contest information and submit your photos! For more information about the Wisconsin and Ozaukee Humane Societies’ calendar contest, please contact Jennifer Feurer at (414)431-6123 or jfeurer@wihumane.org.